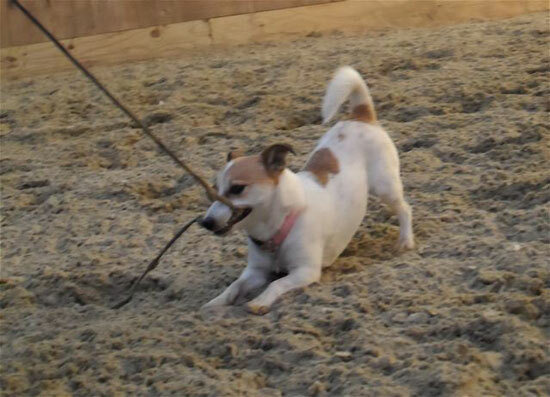 Home › Blogs › Barn Dogs: How to Make Good Manners STAY! 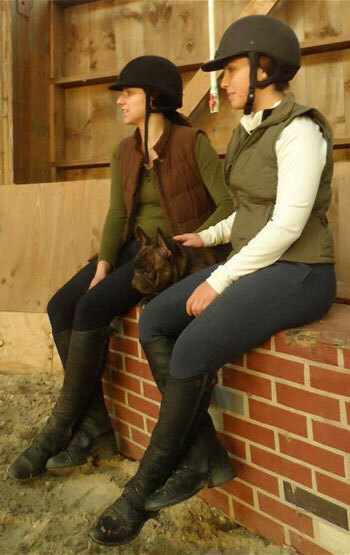 When you walk into the barn with your dog, what is the reaction of other boarders and riders? Do you hear a chorus of welcoming comments like ”Look who’s here!” or whistles and claps as people enthusiastically call him by name so they can be the first to offer him a treat? Or does everyone avoid you and ignore your dog? Perhaps you even catch a disapproving look or hear some shared grumbling. 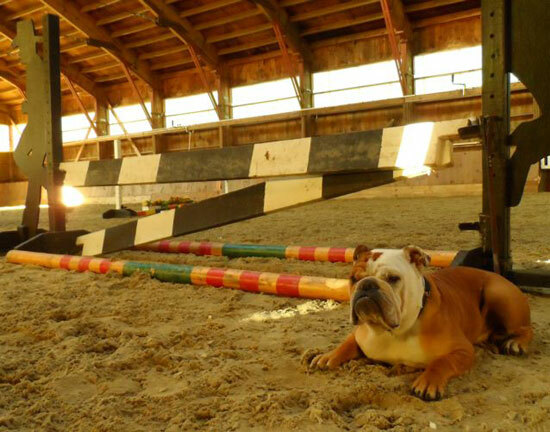 Could it be because your dog considers the barn his personal playground? Does he refuse to stay put or try to “assist” you as you lunge? Has he darted out on the jumping course, made himself part of the fence or, uh-oh, lifted his leg on someone’s new saddle? While your dog may be enjoying himself and his antics may be entertaining sometimes, he could also be putting himself, you, your fellow riders, and everyone’s horses at risk. I know, I know. Your dog goes everywhere with you so why not take him to the barn, too? Besides, you feel so guilty if you leave him home. Still, though you hate to admit it, sometimes he can be a bit of a pain. You find yourself constantly reminding him to down, stay, get back there, and quiet and you know the constant nagging is a drag for anyone within ear shot. Okay, now that you’ve fessed up that there might be a few minor behavior issues, let’s talk about how we can correct them. First, let’s agree on the obvious. It’s no fun for either of you if it’s a constant battle to achieve some good behavior basics, like lying down and being quiet. And we can probably go one step further and agree that it can be really distracting (not to mention dangerous) if your dog breaks position, barks incessantly when tied or confined to a stall or tack room, or gets loose and chases the barn cat! We’ve all seen and admired the dog who can navigate among the horses safely and stay calmly in one spot as his owner teaches, trains, and rides. With a little bit of training and consistency, your dog can be that dog. A safe and welcomed guest whether she is in your arms, on the ground, or asked to stay on a dog bed. That’s it! Four easy steps that will take your dog from stable terror to stable mentor in no time! Before we put on our dog training hat though, we need to be sure that your dog—or any dogs— are even allowed at your barn. If they are, it’s your responsibility to teach your dogs some simple down-stay basics at home before you test them out among the horses. As with all training, teaching your dog a new skill is best done when your dog is tired and hungry. You should also have enough time in your schedule to work with him without interruption or the pressure of time constraints. While solid obedience (your dog’s ability to do what you ask) is important, we are going to begin teaching our exercise by working on good manners (your dog’s ability to make a good decision without a prompt from you). The following tips are designed to pro-actively set your dog up for success. By encouraging him to problem-solve and by rewarding correct behavior, he has the opportunity to earn his food reward and avoid a consequence (a verbal reprimand or snap on the leash). Training should, after all, be fun for both of you! 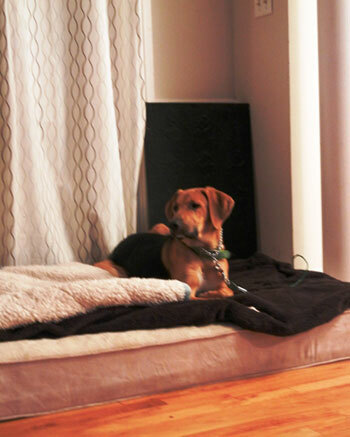 Next, place your dog bed in front of the door (or where you have tied him). Position it where your dog will be tempted to lie down. Now walk away, no command necessary, and sit down in the same room. Do what you want—watch TV, read a book, check your Facebook page—whatever puts you in a relaxed state of mind. If your dog sits or stands simply ignore him. Don’t even glance at him. BUT, if he lies down, take a treat from your bait bag and toss it to him as you simultaneously say “Good go to bed!” Should he get up, ignore him again until he returns to the down position. As soon as he does, label and reward once again. Repeat. Continue until your bait bag is empty. Try to acknowledge his good decision (to lie down) right away so he realizes lying down gets rewarded. Consistent verbal acknowledgement is important so be certain you keep the language the same. Don’t say “Good down!” one time, “Good place!” the next and “Good go to bed!” a bit later. Tone of voice is important, too. While your dog should receive enthusiastic verbal praise, be careful you are not so enthusiastic that you inadvertently encourage him to get up. Here is how this exercise will work as we go forward by giving your dog the visual of a mat or bed, you are allowing him a point of reference that can transfer later when we bring it with us to the barn. Once he has learned the exercise in one area, it will be easy to transfer the same exercise to another. Be sure to use a mat or bed that you won’t mind bringing to the barn and eventually leaving in your locker or trunk, like the Wander Bed. Tethering him to the door prevents him from removing himself from the space you designated and prevents you from having to discipline anything other than barking; rewarding him every time he lies down teaches him that is the desired behavior and encourages him to repeat it. All dogs catch on to this exercise at a very different rate. Energy levels, food drive, and activity level in the room can all affect his learning speed. Be patient and repeat often—ideally on a daily basis—until your dog can automatically lie down and stay down (without a command) while you feed him his entire dinner from the bait bag. As his confidence and consistency increase, begin to do same exercise while you are active in the room-clean, exercise, walk and talk on the phone, etc. Remember, you will not be stationary at the barn. Horses will be walking in and out of the aisles and trotting and cantering in the indoor, kids may be scampering about, not to mention the distractions at the outdoor ring should good weather beckon you outside. Let’s go to the barn! Once you feel confident you are making good progress with this exercise in the comfort of your home, introduce it in the barn. As you do this, simultaneously increase the difficulty at home. Bring your dog, his equipment, bed and food/treats into the barn. Set up the exact same situation in the aisle using whichever door has the safest location for your dog to be in front of. Be sure to choose one that will not be in use while you are there like a stall, the grain room, or washroom. Begin working on it in the aisle as you did at home—be calm first and then become active, walking up and down the aisle, etc. Even if your dog was a genius at home and didn’t make a move or utter a peep, be realistic. Being dismissed at the barn is quite another story. It will be a bit more challenging especially if there are distractions (human, equine, canine or feline) about. I recommend filling your bait bag with fewer low-value treats (by low-value, I mean something like kibble dog food) and more high-value ones (things with more of a YUM! factor like Wellness Pure Rewards) for extra motivation. I would also recommend attaching a second line on your dog in case you need to discipline barking. If he speaks up, instantly say “Quiet!” and bridge that command (repeating it over and over again as you indirectly walk toward him) while you give three small snaps on the line. Never yell or approach your dog in an angry fashion. Simply take a “persistence beats resistance” approach and calmly remind him that barking is not permitted. While it’s important to reward good behavior, there are times to correct inappropriate behavior as well, especially if it is potentially disruptive or dangerous. No one wants their dog to spook a horse! Just remember that the goal of a consequence is to interrupt the dog’s thought process and should be applied with the least pressure possible to get the desired result—in this case a quiet dog. Small successes are important to acknowledge in your dog’s “Stay” training. Remember to make training sessions harder, then easier, and then more challenging again. A possible plan may be working on tethering with your horse in the aisle, then another time without your horse in the aisle. Next, progress from no horses in the indoor to one or two quietly hacking. When your dog is a superstar at this level, it’s time to start working with your own mount while he’s happy and secure on his tether. That way you are available to reinforce the training as necessary. Remember to wear your bait bag when you do start riding during training so you can toss food to your dog as you ride by. Toss out some verbal praise as well. No one knows your dog better than you so get creative. If your dog loves Bully Sticks, be sure to provide him with this yummy long term chew to keep his interest when tethered. Bring extra biscuits so you can ask your friends to do the same and spend time with your dog just hanging out watching other horses and rewarding good behavior. Enlisting the help of others will speed up your dog’s associations, helping him learn faster. 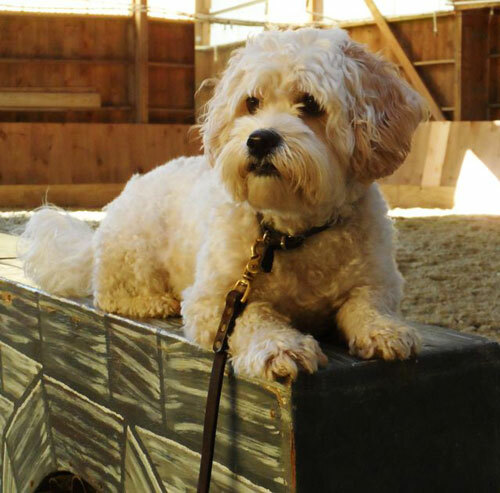 With consistency and practice, your dog will rise to the top of your barn’s doggie A-list, welcomed by everyone and admired for his mastery of good barn manners and a perfected down stay. Best of luck, and happy training! That Jack Russell looks like one sweet dog… So cute!!! Thank you Jen for all your tips, you really help keep my my on track! Hi Everyone. A big thank you to SmartPak for continuing to help equines and canines safely co-exist and to everyone who posed for this blog; Esterbrook Farm, Tricia, Daryl, Michelle and our four-footed friends, Biff, Clark, Harley, Kris, Leena, and of course, Picasso the Pony. You guys are the best! Jen, You have done a wonderful job with Kris, my grandson. We appreciate all your tips and knowledge. Thank you for all you do.